Drenched in Coca-Cola, sweat and confetti after winning the Coca-Cola 600 on May 29, 2016, Martin Truex Jr. noticed a large, red-and-white Coca-Cola vending machine entering Charlotte Motor Speedway's winner's circle. 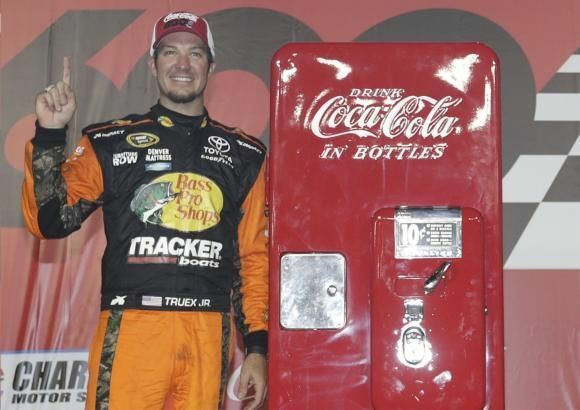 Truex initially thought it made for a nice photo-op, but he could barely contain his excitement when he learned that the decades-old vending machine was his to keep. "That's nice to hear," Terry Kimble said from his office in Grayson, Georgia, nearly a year later. "I never know what the drivers think of them. I don't really get to meet them. I know that we work hard, though." Kimble owns and operates Remember When Restorations, a small company that restores vintage Coca-Cola vending machines. He realized nearly 30 years ago that the demand for old Coke memorabilia spans the globe. A member of the Atlanta Police Department for 17 years, Kimble left the force at age 39 to work full time on restorations in 1989. What steered the Charleston, West Virginia, native - who has restored roughly 600 vending machines - to NASCAR was a suggestion from Irish golfer Padraig Harrington. Harrington met with Coca-Cola Sports Marketing Director Ben Reiling and a group of people at an event during the PGA's TOUR Championship in 2009. Harrington, an aficionado of antique vending machines, suggested that Coca-Cola give one to the winner of the TOUR Championship every year. Reiling shared the idea with one of Coca-Cola's leaders, Bea Perez, who signed off on the concept. Reiling joined Coca-Cola's PGA team of John Egan and Kasia Horner and after a weekend of hard work, presented 2009 TOUR Championship winner Phil Mickelson with an antique vending machine. The next May, Kurt Busch won the Coca-Cola 600, the Bruton Smith Trophy and a vintage Coca-Cola machine. Kimble is Coca-Cola's point man for the restorations. "It takes approximately 60 days to restore one from start to finish," Kimble said. "We try to do two or three at a time. It's a very in-depth process because we take a machine completely apart. Even the insulation comes out. We take it and have it sandblasted after it's taken apart, get all the old paint and rust off it and then our painter, Jeremy Black in most cases, does his thing. … We're very particular about the color of red paint we use. After it's painted, we get parts re-chromed, we use new gaskets and screws. We put a new compressor in it to make sure that years from now it's going to work fine. We're really particular about authenticity. We're really particular about the decals we use from that era - which is usually the 1950s - and about everything. I want it to be as authentic as possible. It's like a classic car." The winner of this year's Coca-Cola 600 will receive a Cavalier 51 model. Truex, who will chase his second machine on May 28, keeps last year's prize in his Mooresville, North Carolina, office. "I guess you can say we received a classic piece of history for winning a classic race in historical fashion," Truex said. "It might have felt like a dream-kind-of win, but it was the real thing."